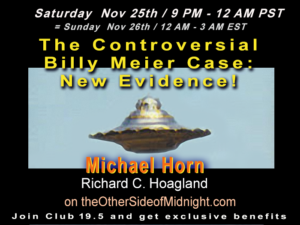 Listen to Richard Giordano interview Michael Horn on The Paranormal Code. Richard is a long time UFO investigator, based in Sedona, Arizona. In this article, the term Motivated Reasoning is used to explain why…facts don’t matter to some people who have already made up their minds about a subject. In light of our recent publication of Harry Lear’s Open Letter to President Trump, it’s timely also to link to this article, by Christian Frehner, documenting the discussions between Meier and the Plejaren, from 1980, about the true value of Pi, and also from 2017, regarding Lear’s historical new information. I recently took long overdue action against failed skeptic Derek Bartholomaus, who had crossed the line of factuality, as well as decency, in his vain and libelous attacks on Billy Meier. Be there, or be hyper-dimensional!